See below for optional extras. £75.00 per calendar month. Paid monthly. Installation charge from £1700. 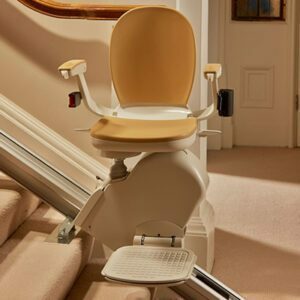 (Stannah 260 stairlift on a standard staircase with one 90 degree bend, 6mtrs of rail and a manually swivelling seat) – the manufacture of bespoke rail is still required for curved stairlift rental. One month rental included in the installation charge. Installed within 4 weeks of ordering. 3hr installation time on the day. Easy to use, reliable equipment. 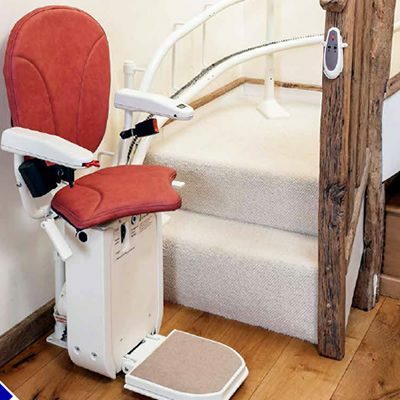 In order to keep rental costs low we use good quality reconditioned stairlifts, a typical example is shown above, but please be aware we cannot always guarantee a specific seat style or colour. We will need to undertake a full technical survey once you have decided on a curved rental stairlift, at this survey we will require a deposit of £1500 (full balance of the installation charge payable once the stairlift is installed). The manufacture of bespoke rail is still required for curved stairlift rental.